Founded in 1982, by David S Alexander, with only 138,000 barrels of storage, Caljet is now the largest independent motor fuels terminal in the U.S. Southwest, having grown in size to over 1,090,000 barrels of storage. Refined products and biofuels are received from refineries and producers via pipeline, railcar and truck, and transferred into storage tanks. As requested by our clients, finished products are transferred from storage, through sophisticated pipeline and injection systems, to the loading rack. Large tanker trucks enter the loading rack where they may load specific products bound for the designated end user, such as retail gasoline stations or other fueling facilities. 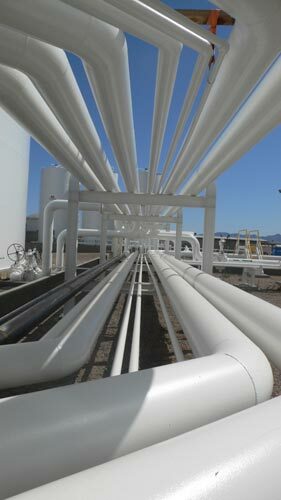 With over 33 years of experience in the motor fuels terminalling business, supported by an experienced, professional and reliable team effort, Caljet continues to expand its operations, striving to provide its clients, and citizens of Arizona, sufficient terminal storage of petroleum products for the growing market, convenience, and value added service.